And I’ve been that way even as a young adult, BK – Before Kids. Now, AK – After Kids, my kids are the reason I get out of bed. And then the second reason I get out of bed is to make breakfast for my kids. So things haven’t changed too much I suppose. Breakfasts for me mean high-fibre, not too much sugar, full cream milk or yogurt and maybe a little fresh or dried fruit on the side. Sounds good, right? And yes, it is a pretty good breakfast I think, compared to all the boxes of colourful carbs advertised with popular characters that they call “breakfast”. But, it’s only half of what a good breakfast should be. By 9am, I am starving. Starving as in “Hey, it’s time for second breakfast!” You know, like hobbits do. Because seriously, my body burns up all the breakfast carbs so quickly. Even if they are full of fibre and more complex carbs, it’s just not enough. We should do some eggs! That morning was the dawn of our Breakfast Revolution and wonderful things happened. First off, it changed our kids. My youngest son’s moods have always been somewhat erratic. However, when I picked him up from school the morning we gave him eggs, the teacher asked me: “What did you give your son for breakfast this morning? He is a different child!” Those were her exact words! She told me how happy and energetic he had been that day. I couldn’t believe what a difference a little plate of scrambled eggs made! Then for me – I became less of a hobbit and I no longer needed “Second Breakfast” at 9am. I still may eat lunches slightly early, but my body’s blood sugar levels are much more even and happier. This also has helped curb my carb-cravings at 9am, which my waist-line is definitely thankful for. My husband loved how satiated he felt even a while after breakfast. He also appreciates the fact that eggs are such an economical yet nutritious form of protein that we can afford to eat every morning. Although the question has now evolved to, how can you not afford a good breakfast? Now, you may be wondering: What about the cholesterol that all those dietitians warned us about? Nowadays, studies show that the cholesterol eggs contain is actually dietary cholesterol – different from the blood cholesterol in your body. Despite the warnings of the past, eating eggs will not increase your blood cholesterol levels. Not convinced? Here’s an article that the National Heart Foundation of Australia wrote about Eggs and Cholesterol. 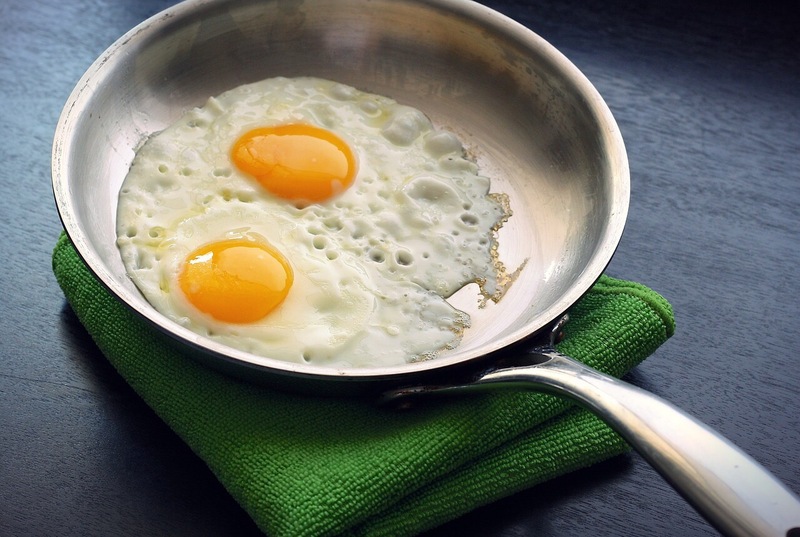 There are so many wonderful articles out there about all the benefits of eggs. But, if you cannot see yourself eating eggs every morning, do try some other form of healthy protein that you enjoy. Your breakfasts need not be time-consuming to prepare, but make sure they contain nutritious foods high in fibre and protein. Plus, you won’t be feeling so starving by lunch time. If you are super busy during the day and you usually don’t get time to have a good lunch, or at all, you can at least take comfort in the fact that your breakfast was AWESOME. So it’s not a train-smash if lunch was a bit rushed, or skipped. In conclusion, may I add my disclaimer: I am not a dietician, so if what I am saying doesn’t suit you, please consult a qualified dietician! However, my ultimate point that I am trying to make is to convince you to make your breakfasts better by adding some good form of protein. You will surely see the difference over time. (I am quite confident that any dietician will agree). Having a good breakfast has really helped our family in our daily lives to feel more energized and capable of completing the day’s tasks. If you contemplate the growing bodies and minds of your children, there is no question that you will want to give them the best. And for the rest of us adults growing older through the years, our bodies need natural and nutritious foods that serves us well and keeps us healthy. Feel free to comment below about super nutritious breakfast ideas that you love, I’d really enjoy to hear from you! Dear Cami, This is a wonderful article. Mom and I are going to try it! Love you! Dad.